There’s not a single person who’s done more to fight climate change than Bill McKibben. Through thoughtful books, ubiquitous magazine contributions, and, most notably, the founding of 350.org (an international non-profit dedicated to fighting global warming), McKibben has committed his life to saving the planet. For all the passion fueling his efforts, though, there’s something weirdly amiss in his approach to reducing greenhouse gas emissions: neither he nor 350.org will actively promote a vegan diet. Given the nature of our current discourse on climate change, this omission might not seem a problem. Vegans are still considered as sort of “out there,” a fringe group of animal rights activists with pasty skin and protein issues. However, as a recent report from the World Preservation Foundation confirms, ignoring veganism in the fight against climate change is sort of like ignoring fast food in the fight against obesity. Forget ending dirty coal or natural gas pipelines. As the WPF report shows, veganism offers the single most effective path to reducing global climate change. The evidence is powerful. Eating a vegan diet, according to the study, is seven times more effective at reducing emissions than eating a local meat-based diet. A global vegan diet (of conventional crops) would reduce dietary emissions by 87 percent, compared to a token 8 percent for “sustainable meat and dairy.” In light of the fact that the overall environmental impact of livestock is greater than that of burning coal, natural gas, and crude oil, this 87 percent cut (94 percent if the plants were grown organically) would come pretty close to putting 350.org out of business, which I’m sure would make McKibben a happy man. There’s much more to consider. Many consumers think they can substitute chicken for beef and make a meaningful difference in their dietary footprint. Not so. According to a 2010 study cited in the WPF report, such a substitution would achieve a “net reduction in environmental impact” of 5 to 13 percent. When it comes to lowering the costs of mitigating climate change, the study shows that a diet devoid of ruminants would reduce the costs of fighting climate change by 50 percent; a vegan diet would do so by over 80 percent. Overall, the point seems pretty strong: global veganism could do more than any other single action to reduce GHG emissions. So why is it that 350.org tells me (in an e-mail) that, while it’s “pretty clear” that eating less meat is a good idea, “we don’t really take official stances on issues like veganism”? Well why the heck not?! Why would an environmental organization committed to reducing greenhouse gas emissions not officially oppose the largest cause of greenhouse gas emissions–the production of meat and meat-based products? It’s baffling. And while I don’t have a definite answer, I do have a few thoughts on the matter. Part of the problem is that environmentalists, including McKibben himself, are generally agnostic about meat. A recent article McKibben wrote for Orion Magazine reveals an otherwise principled environmentalist going a bit loopy in the face of the meat question. The tone is uncharacteristically cute, even folksy, and it’s entirely out of sync with the gravity of the environmental issues at stake. 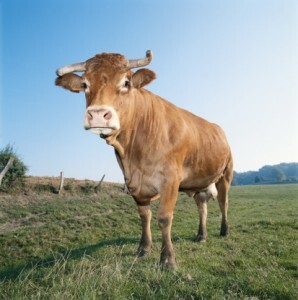 Moreover, his claim that “I Do Not Have a Cow in this Fight” is a rather astounding assessment coming from a person who is so dedicated to reducing global warming that he supposedly keeps his thermostat in the 50s all winter and eschews destination vacations for fear of running up his personal carbon debt. I’d think the man has every cow in the world in this fight. So to the real question: how do we explain this agnosticism? The fact that McKibben recently traveled to the White House to oppose the construction of a natural gas pipeline (and got arrested in the process), provides a hint of an answer. I imagine that getting slammed in the clinker after protesting a massive pipeline project is a lot better for 350.org’s profile than staying at home, munching kale, and advising others to explore veganism. In this respect, the comparative beneficial impact of global veganism versus eliminating natural gas from Canadian tar sands matters none. What matters is grabbing a headline or two. Hence the “problem” with veganism and environmentalism. Ever since Silent Spring (Rachel Carson’s expose of dangerous insecticides) modern environmentalism has depended on high-profile media moments to shore up the activist base. Veganism, however, hardly lends itself to this role. Although quietly empowering in its own way, going vegan is an act poorly suited to sensational publicity. Pipelines and other brute technological intrusions, by contrast, are not only crudely visible, but they provide us (the media) with clear victims, perpetrators, and a dark narrative of decline. I think this distinction explains much of McKibben’s–not to mention the environmental movement’s– wobbly stance on meat. This all sounds well and good. But if the statistics in the WPF report are to be trusted, the environmental impacts of this alternative would be minimal. So why the drum beat of support for rotational grazing? I would suggest that the underlying appeal in the pasture solution is something not so much calculated as irrational: pastured animals mimic, however imperfectly, symbiotic patterns that existed before humans arrived to muck things up. In this sense, rotational grazing supports one of the more appealing (if damaging) myths at the core of contemporary environmentalism: the notion that nature is more natural in the absence of human beings. Put differently, rotational grazing speaks powerfully to the aesthetics of environmentalism while confirming a bias against the built environment; a pipeline, not so much. e idea of personal agency. For most people, meat is essentially something we cook and eat. Naturally, it’s much more than that. But for most consumers, meat is first and foremost a personal decision about what we put into our body. By contrast, what comes to mind when you envision an old coal-fired power plant? Many will conjure up sooty images of a degraded environment. In this respect, the coal-fired power plant symbolizes not a personal choice, or a direct source of pleasure, but an oppressive intrusion into our lives, leaving us feeling violated and powerless. Environmentalists, I would thus venture, go after coal rather than cows, not because coal is necessarily more harmful to the environment (it appears not to be), but because cows mean meat, and meat, however wrongly, means freedom to pursue happiness. I don’t mean to downplay the impact of these factors. The visibility of pipelines, the romantic appeal of pastures, and the deep-seated belief that we can eat whatever we damn well shove into our mouths are no mean hurdles to overcome. But given that the documented power of veganism to directly confront global warming, and given the fact that emissions have only intensified alongside all efforts to lower them, I’d suggest McKibben, 350.org, and the environmental movement as a whole trade up their carnivorous agnosticism for a fire-and brimstone dose of vegan fundamentalism. Or grow your meat in the lab. Supposedly 80 to 95 percent less greenhouse gas. Out of curiosity, how much would vegetarianism reduce emissions? How much extra benefit is it to go vegan instead of vegetarian? If even many environmentalists are unwilling to substantially change their lifestyles to reduce greenhouse emissions it is clear that the only solution is some sort of geoengineering that can allow out civilization to have its meat and eat it to. The reality is that eliminating meat from our diet has zero effect on capitalism and eliminating oil has a big negative effect on capitalism, so the environmentalists, no matter how sincere or well meaning have no interest in it. 1. If we were vegan, we wouldn't need (as much) livestock. 2. The land currently used to grow crops to feed livestock would either be repurposed to feed humans or left wild. The latter would provide food to wild game instead. 3. With more food provided to wild game, the number of wild game would increase. 4. Theory: The number of wild game would increase proportionally compared to the decrease of livestock, as the land that fed livestock now feeds wild game. 5. Question: How do the emissions of wild game compare to livestock? Your statement that substituting chicken for beef would only drop emissions by 5-13% makes me wonder how much of an emissions difference there really is between different types of animals. What do these 50-80% cost reduction analyses assume will fill the herbivore gap left by removing livestock, if anything? If people are going to guilt-trip me into completely changing my diet to save the environment, I would like to be assured it isn't going to be found moot later. Yes, just the other day I saw a heard of thousands of deer coming out of a few acres of woods and trample the surrounding area...wait, no I didn't. OK, get it. The invisible threat is worse than the visible one. But there is huge difference between the two: Cows are tasty, especially when grilled over a natural charcoal fire. Coal is never tasty. "You can have my porthouse when you pry it from my hot Weber grill." I am always suspicious that doing everything we can to pack more people unto a planet with dwindling resources necessitates this kind of thinking. The average first-world baby contributes over one-million kilograms of CO2 throughout its lifetime. Meat-eating environmentalists are the biggest hypocrites in the world, and instantly lose any and all credibility. "You can have my porterhouse steak when it has grilled just past medium-rare and rested for five minutes." I am very skeptical of this. I managed to find a somewhat related analysis of a claim by E. O. Wilson that the world is facing a food shortage, and the way to solve it was to switch to vegetarianism, as that would, by itself, increase food production capability enough to feed 30+% more people. In the end this post and the E.O. Wilson post are about inputs and outputs; energy in to the food system and energy out. As a libertarian, I am just happy that the far left has continued to allow me to pass gas in peace. I would have expected by 2012 to have to wear some pseudo-colostomy bag thing to recycle my essence into fuel for George Clooney's Prius or something. As to the cow/vegan thing....I have often wondered why this has not been tackled as a major bio-engineering/genetics/breeding Task Force Alpha project. If we can breed Labradoodles we should be able to breed a cow that doesn't fart 1000 litres a day. Or maybe its the feed. Whatever. It's impolite. Another reason might be that environmentalists are trying to fight the perception that environmentalism is an attack on the modern lifestyle. Sure, all these problems could be solved if everyone went vegan, and stopped driving cars and stopped using electricity, but when you go around trying to shame people into giving up their comfortable lifestyle to live in yurts and eat tree bark (their perception, not mine) they tune you out. The point is that shame doesn’t work, and threats don’t work, they just cause pushback. 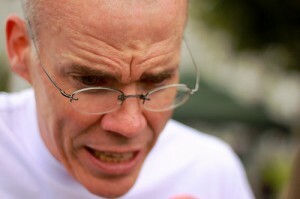 McKibben probably doesn’t promote veganism because it won’t work, it will just turn more people off the movement. But, when I've seen this kind of thing in the past what they're usually doing is comparing the efficiency of feeding corn and soybeans to cattle and then eating the cattle to just eating the corn and soybeans. This leaves out a lot of the complexity in the system. One facet is that pastured cattle mostly eat grass and people can't eat grass directly. Another way of looking at it is that for every pound of grass raised beef there's a pound plus of grain and beans somebody isn't eating somewhere. This applies to pretty much all livestock. Pen them up and feed them people food, and yes, it's less efficient. Contain them loosely and feed them things people can't eat and the equation changes dramatically. There are other factors too, such as transport and waste disposal, energy consumption, pasture vs. row crop vs. alternative techniques, processing, and the effects of subsidies, but they all pretty much follow the same kind of pattern. Or, we could intelligently manage pastureland for maximum ecological diversity, instead of aggressively promoting monoculture for vegan purposes. Check out this video: http://vimeo.com/8239427, on healing the environment through the wise use of grazing. Also, please quit trolling the economics blog with vegan junk. What you seem to be saying is that a carbon tax that includes meat is still the most efficient way of internalizing the GHG externalities. no environmentalist wants to take a stand that is generally unpopular. it's much easier to get people to agree with you by blaming faceless corporations than by blaming the general populace. after all it is the general populace that you're trying to get onside. blaming meat is blaming meat eaters. most people (in the US) are meat eaters. it's a big lifestyle change to cease to be a meat eater. meat is the highlight of the meal for most meat eaters. people don't like being less happy to help something that they don't/can't see. no single person becoming vegan makes a noticeable difference. it's in no person's best interest to personally give up meat for environmental reasons. I'm not standing up for the environmentalists, but as a physician who treats people with B12 deficiency, I can say that the vegan diet is absolutely insufficient for a human's dietary needs. B12 comes from animal sources, period. Don't let the quakery trick you. Those who are vegan can subsist on the B12 stores already in their livers for up to a decade or more, but will then develop neuropathies, dementia, and/or other problems eventually leading to death if untreated. The original rural people who practiced veganism got their B12 from insect particles in their less-processed crops. When many migrated to the developed countries and began eating crops with modern processing, the insect particles were no longer present and they began developing B12 deficiencies as a population years later. Somehow I'm intrigued but not overly surprised by this, and as usual, people go for those big visually striking enemies. So, according to this my carbon footprint is more affected by animal products than energy consumption. I could generate all my power by a gas generator, live comfortably and still produce less carbon as vegan. Good to know that the environmentalists are extremely Quixotic. I'm all about going after the biggest offender and reducing all forms of viable pollution. I bet farms wouldn't be covered under a carbon tax or cap and trade, even though they are the largest offenders.